It’s customary in our Camden office, that if we’re offered a discount to try a new cafe opening, we have to go! Last week we received a flyer for new cafe – Music & Beans. 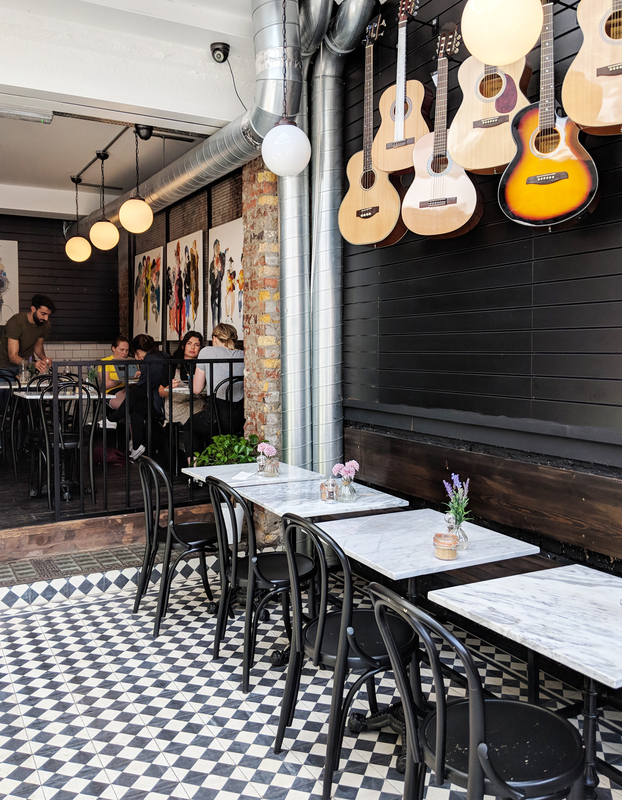 Located in between Camden and Mornington Crescent stations, on Camden high street, Music & Beans offers just that – music and coffee! 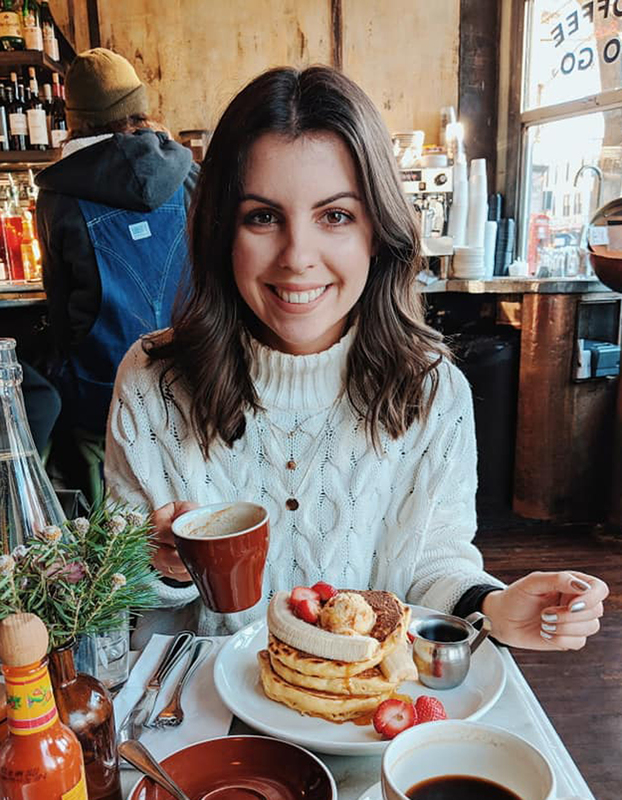 Whether you’re looking for a music lesson, or simply want to take a coffee break, this Instagram worthy hang out is a great spot to do either! 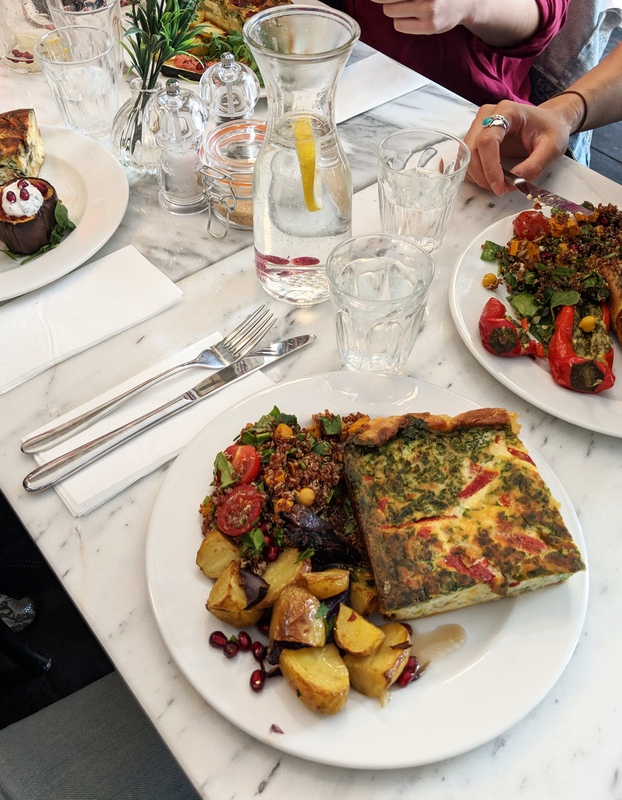 With a second branch on Harringay Green Lane, both locations offer a simple but delicious menu of food and drink. We stopped by for lunch and loved all of the choices on display. From homemade quiche to frittata, from salmon to a variety of salads. There’s a tasty option for everyone. 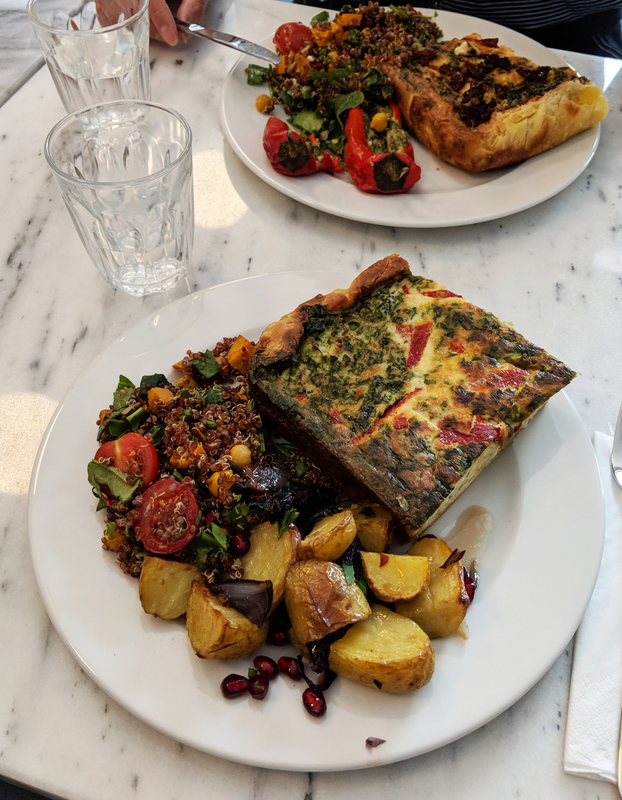 I opted for the broccoli and red pepper quiche, with two salads – roast potatoes, red onion & pomegranate, plus quinoa & chickpea. The slice of quiche was warmed and was a pretty hefty portion to say the least! I asked for a box to take half home with me, as I couldn’t manage it. That’s not to say I didn’t enjoy it though. All the food is presented beautifully and dressed with pomegranate seeds and herbs. Even the carafes of tap water look pretty, with pomegranate seeds and lemon. If I remember correctly, a main and two salads was around £10 – £11. Otherwise 3 salads was around £8 – £10, or 2 salads for a little less. Fairly priced for a sit down meal with waitress service, in the heart of Camden. Equally, the cafe has a relaxed vibe and although it was busy, we didn’t feel rushed to leave. The waiter managed to get all of our dishes mixed up, but I won’t hold that against them!